A marriage proposal is an event where one person in a relationship asks for the other's hand in marriage. If accepted, it marks the initiation of engagement, a mutual promise of later marriage. It often has a ritual quality, sometimes involving the presentation of an engagement ring and the formal asking of a question for example "Will you marry me, ...?" In the Anglosphere it is traditional for the man to make a proposal to the woman directly while genuflecting in front of her; the man sometimes puts the engagement ring on her finger at this point, as opposed to merely offering it to her. Sometimes the proposal is intended to be a surprise. If the woman accepts the proposal, she will typically assent to the man verbally and wear the ring during the time leading up to the wedding, known as the engagement. Acceptance of the proposal is not compulsory in Western culture; a woman may decline a proposal for various reasons, and may not declare what the reasons are. The average duration of preceding courtship varies considerably throughout the world. 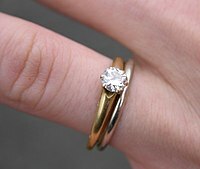 In Scotland and Ireland, 29 February in a leap year is said to be the one day when a woman can propose to her partner. Finland has the same custom, with the addition that a man rejecting such a proposal was expected to buy his suitor enough cloth for a skirt as compensation. As a monarch, Queen Victoria had to propose to Prince Albert. Proposals by women have become more common in the Anglosphere in recent years, so jewelry companies have manufactured engagement rings for men. In the United States, about 5% of proposals are made by women. Younger people are less likely to approve of women proposing.